Use the correct tool for pulling your flywheel! Whether you have a 66 4 Speed , a 76 360CR, 81 430XC, or 92 610TE, you need the correct flywheel puller or you will cause more damage than what you are intending to fix. The most expensive item on your Husqvarna is the ignition. If you treat it well, it will last 50 years or more. 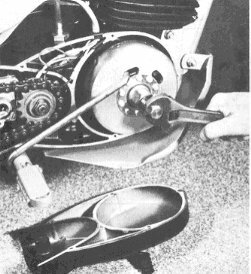 1) a tool to hold flywheel while you loosen or tighten nut. 2) a puller to correctly remove flywheel. 3) the correct size, 6 point, metric socket to use on nut, 25mm or whatever is correct. The nut holding the flywheel on is LEFT hand thread! You must have a correct threaded puller. You must have good threads on flywheel for puller. Your puller must thread in flywheel fully. You must grease end of crank point of contact puller/crank. If you are working with an old , unserviced bike, that you have not had apart, even a good tool may not remove the flywheel. 85-87 4 Strokes w/inboard flywheel MFP-287 I can fabricte this , but need help in finding out threads and dimensions. Wanted 1987-2002 Husqvarna flywheel pullers and application. Or Husqvarna flywheels from this era with good puller threads. fits Bosch, Femsa, Motoplat, SEM. This is the key that aligns the magneto flywheel. The parts book shows different numbers but this key is same all years. You don't need a holding tool to remove left hand nut , if you use an air powered inpact wrench, only the correct direction. Flywheel magnetism can be a big factor in firing power, check it while off. Clean up all burrs and bad fit to ensure the tool and the process stays simple and repeatable. 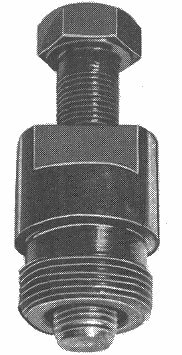 You may want to lap your flywheel and shaft together, using fine valve compound and about 30 seconds of twist-o-turn. The left hand nut should spin on and off easily by hand, if not, correct problem! Generally, Femsa, Motoplat, Bosch, etc all take specific crank ends. Don't buy a motoplat on E-bay thinking it will bolt in place of your Femsa. All Femsa are not same - early 69-71 have a larger coil backing plate than 72-77, however all pieces coils/points/cond/flywheel will interchange. Use a dial indicator down the plug hole to mark TDC on flywheel and engine cases. Use a Sharpie pen , don't scratch or stamp any marks in the flywheel or cases. Use a dial indicator or a calculated mark on flywheel with a continuity light across points for Femsa. Motoplat uses a pin hole. spare flywheel keys - I can supply these, see table above.